They say it takes three years in most businesses to see if they've got what it takes to make it. While it's too soon to tell the fate of a first year out company, AltRider appears to have done quite a bit right in their first twelve months. Jeremy Lebreton left his Midwest home at the turn of the century and headed west to Seattle, where he apprenticed with a fabricator in the the Georgetown district. 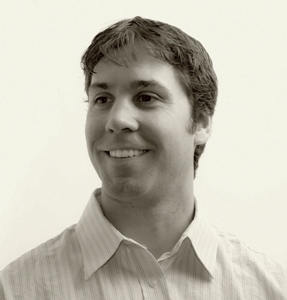 At the same time, he picked up a residency at the University of Washington and completed his degree in their Business program. In 2005 Lebreton (at right) joined the team at Touratec USA. By that time, the company was growing by leaps and bounds and he stayed on into late spring of 2009. But Lebreton was ready to carve his own niche in the motorcycle aftermarket accessories market. He spent nine months developing his plan, doing his research and beginning the development of several products. In March of 2010, AltRider officially opened their doors on Aurora Avenue North and, more importantly, online. The first items to come out were add-on skid plates, engine guards and kickstand footprints for bikes like the Suzuki V-Strom, KTM 990 Adventure and BMW F800GS. The company has now brought close to 100 specialty add-on parts to the market in just twelve months. "It usually takes about four to six weeks to bring a part to market," say Lebreton. But a lot can happen in that period of time. By the time AltRider got their skid plate on the market for the BMW F800GS, there were 20 plus models available from all over. In an effort to be prepared for the US release of Yamaha's Super Tenere, Lebreton purchased a sort-of visa to bring an Australian model of the bike to the US and kept it here for several weeks this past winter, before having to ship it back. During that time, he was able to develop and design various engine guards and protective plates. When the bike hits the US market this spring, AltRider is all set with a cadre of add-ons. 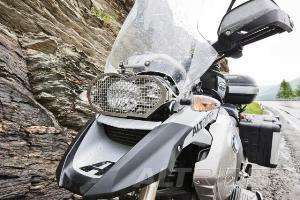 The R1200GS light guard (above) developed by AltRider has been a good seller during their first year. 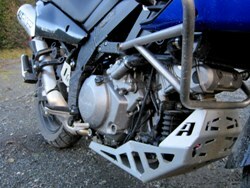 Ditto for the skid plate that fits Suzuki V-Strom models (below). To meet demand on new items, Lebreton has eight partnerships around the US with metal workers. Four are conveniently here in the Northwest which provides him the luxury of making quick decisions on parts in development. Within a few minutes, he can be at a partner site examining tolerance levels, thicknesses and all the other factors that go into creating a quality part designed to protect a bike. One of the hardest issues for Lebreton during the first year has been sourcing quality engineers locally to conspire on the next designs. He's finally reached a point where he has a good pool to draw from. Another rough spot came early on when he was sourcing capital. With the economy in a slump, Lebreton had to work through no less than eleven banks to source the funding for the AltRider startup. But if you can start a company in a down economy, the only place is up from there if you do it right, and the AltRider team worked hard its first year to make things happen. On top of product development, they've built a dealer network, grasped social networking and spent countless hours being present at trade shows and rallies. The exposure has paid off with the company picking up an after-market development job with the film makers of the Long Way Around/Down series. In four short weeks this past winter, Lebreton and crew developed and finished protective parts for a Ducati Multistrada that will be used for Ziggy Marley's Africa Road Trip movie, coming out later this year.